Its August, which means back-to-school time is just around the corner! Start preparing by stocking up on some of our favorite back-to-school snacks perfect for lunch boxes. Cracker Sandwiches: These are simple, yet popular back-to-school snacks. 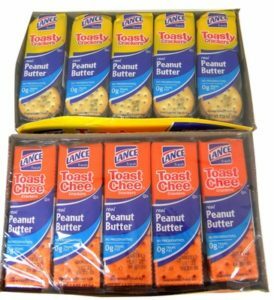 With a wide variety of flavors from Peanut Butter to Grilled Cheese to Vanilla, you’re sure to find some cracker sandwiches your child will love to find in their lunch box. Fruit Snacks: Kids love gummy fruit snacks! They’re made with real fruit, and each pack includes an excellent source of Vitamins A, C and E.
Peanuts, Cashews, Sunflower Seeds: These satisfying snacks also come in convenient, single-serving packs. They’re also perfect afternoon snacks for controlling hunger and boosting productivity levels. Save money by buying bulk boxes! PopTarts: These on-the-go snacks come in a microwave-friendly wrapper. Simply heat up and go on those rushed mornings. Mints: Chewing gum generally isn’t an option after the bell rings, but kids can stay fresh after lunch with mints like BreathSavers, Mentos, and more. If you have a loved one going back to college this fall, help them start their year off right with our Can of College Fun Treats & Sweets! This gallon-sized tin of college essentials includes chips, pretzels, cough drops, Hershey bars, and more. August is National Peach Month – and we’re celebrating our favorite peach-flavored candies! Perhaps the most popular peach-flavored candies are gummy peach rings – ring-shaped gummies ripe with a fresh, yummy peach flavor and an underlying layer of soft marshmallow. (Peach fuzz is replaced with a coat of sugar.) Since their invention in the 1920’s, these gummy rings have paved the way for several other fabulous flavors, like green apple and melon; but none of these alternatives have been able to match the popularity of peach rings. And nothing beats the sweet aroma that arises from a just-opened bag of them! Many of us can also recall placing a peach ring on each finger and admiring some sweet jewelry before ripping them off with our teeth. 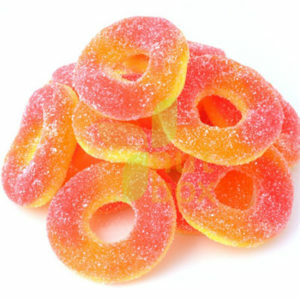 Peach gummies are also available in the form of sour peach slices. If you’re feeling nostalgic after enjoying peach rings this month, try indulging in some peach chews! These bite-sized candies consist of chewy taffy that’s individually wrapped and infused with yummy peach flavor. Perhaps newest to the family of peach-flavored candies are Peach Lemonade Tic Tac’s! These tiny candies start with a peach flavor, and change to lemonade as they melt in your mouth. We can’t think of any candy that’s better to enjoy on a summer day! Looking for a snack that will keep them fueled all summer long? Individual packages of peanuts, cashews, and pistachios are perfect for summertime snacking. You’ll find a variety of flavors sure to please any palette. Pre-packaged makes for easy travel AND they hold up well in the heat! 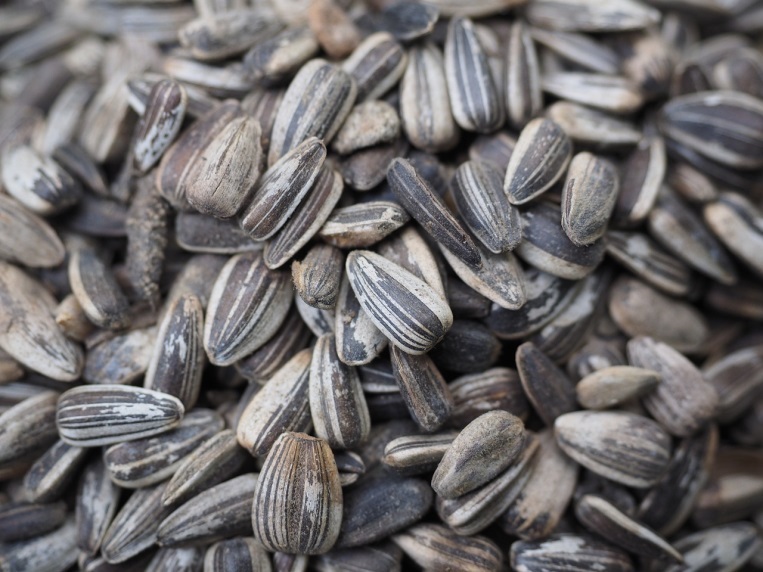 Sunflower and pumpkin seed are a summertime staple. Individually wrapped packages allows for these seed treats to transport easily, whether on road trips, during beach trips, or as lunch times snacks at camp. No lunch bag is complete with a package of sandwich crackers! From whole grain crackers with cheese filling to cheese crackers slathered in peanut butter, they’re a healthy, quick, and easy clean-up addition to any summertime adventure! Jerky strips and SlimJims are a favorite for those who need energy after swimming, running around, and having fun. These snacks are light, hearty, and will keep them full all day long! Nothing satisfies a grumbling stomach quite like the crunch of a favorite potato chip. Individually sized snack bags are perfect for packing and for taking along for a lengthy car ride. Are they looking for something extra sweet? Gummy candies hold up in the heat, are light weight, and provide just the right amount of sugar to satisfy a sweet tooth. Look for fun summer shapes, such as gummy sharks, gummy butterflies, or gummy fish! Ready for the long summer days ahead? Stock up on your favorite snacks and keep them full and fueled all season long!